Cambridge, Massachusetts, based Onshape, a fully cloud-based CAD software system for the manufacturing markets, has released another important update and industry leading new feature in ‘in-context’ design. Designers want the ability to edit parts within the context of an assembly (top-down design) to ensure fit and function by defining relationships between components. We believe that traditional approaches to top-down design have demoed well, but have not largely been successful when used in real-world design scenarios. The issue comes down to unpredictable geometry changes and feature corruption when using in-context relationships. The issue is complex relationships are often stored in multiple files. Users have no control over how and when these complex relationships update. Sometimes the relationship is recalculated when a part is rebuilt and sometimes when the assembly is updated. 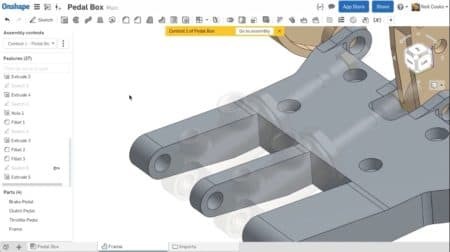 01 – The new in-context design features on Onshape push the Cambridge-based MCAD upstart into a leading industry position with respect to this complex MCAD reality. Due to this complexity, some companies have told Onshape that they have banned the use of ‘in-context’ relationships because of their unpredictability. Onshape has now solved all the problems associated with in-context design. You can use multiple assembly contexts and us them to edit a single or multiple parts. You can update the assembly in context (the state of the assembly) if needed. Onshape combines the power of their new Part Studios (multiple-part design environment) and full-cloud CAD ability to restore to any point in time. 02 – In-context editing in action with the latest update to Onshape. Notice, the ghosted elements are parts, perhaps imported parts, as elements of an entire assembly. The manifold (in grey) was edited in reference to the ghosted parts, establishing relationships that are retainable, manageable and predictable. This latest update also includes enhancements such as named assembly views, the ability to import data with geometry faults, and numerous drawing enhancements. Onshape’s Drawings module is built using Graebert’s ARES technology. To learn more about Onshape visit here.